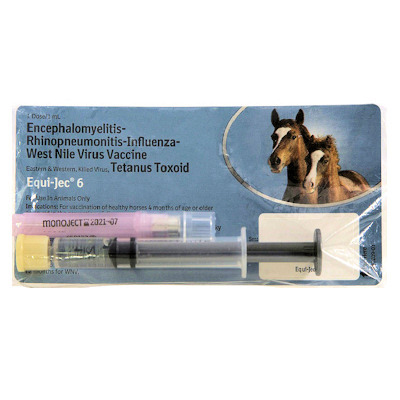 Equi-Jec 6 (Boehringer-Ingelheim) (7 way vaccine) this vaccine is identical to Prestige 5 + WNV which is on manu. Back Order. It protects against Eastern and Western Encephalomyelitis (sleeping sickness), and tetanus, as an aid in the reduction of respiratory disease caused by Equine Influenza Virus (EIV) contains Ky/95 linage, Florida sublinage clade1 (OH/03) and Eurasian New Market/2/93 (NM 2/93 Flu strains. Also protects against equine Herpesvirus type 1(EHV-1) and type 4(EHV-4) and West Nile Virus. Safe for Pregnant Mares. Safe for horses as young as 4 months of age. Dosage: 1 ml dose with needle in a preloaded syringe assuming this is the annual revaccination dose for horses vaccinated 12 months earlier for the same diseases.